Manic, all-out garage rock produced by Tim Kerr. 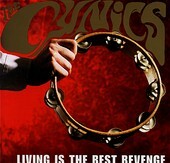 The Cynics' Living Is The Best Revenge is a sonic blast through loud, burning guitars, slamming rhythms, and lots of fast, danceable beats that are sure to burn up the dance floor. The band wails on their guitars, crashes against the bass, and pounds on the drums, cranking out fierce, fiery garage music that is meant to be heard live above and beyond anything else. That's The Cynics for you and, if their music is any indication, living truly is the best revenge. So crank up this record and let the neighbors know how you really feel. I'll give it a B.